While any marketing may generate interest from cash buyers under the right circumstances, these 4 ways to market your property to cash buyers in Tucson can probably do it faster. Target international real estate brokerages, real estate clubs and auction sales to locate buyers. Then list the property at the right price investors can’t resist. 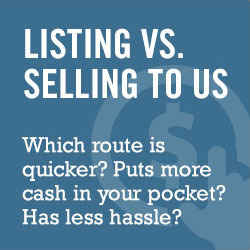 With enough cash buyers, you may get a few offers higher than the traditional wholesale price. If you are looking for investment properties in Tucson, give us a call at (520) 433-9298. We have a steady flow of new properties coming in but they usually sell fast. Additionally, you can fill out the form on our website and we can send you new listings as we get them.